uh... Pay up for what? I assume they were having a bet on who would get to 70 first? Uhh gratz? I guess I'll have to pay you tomorrow . 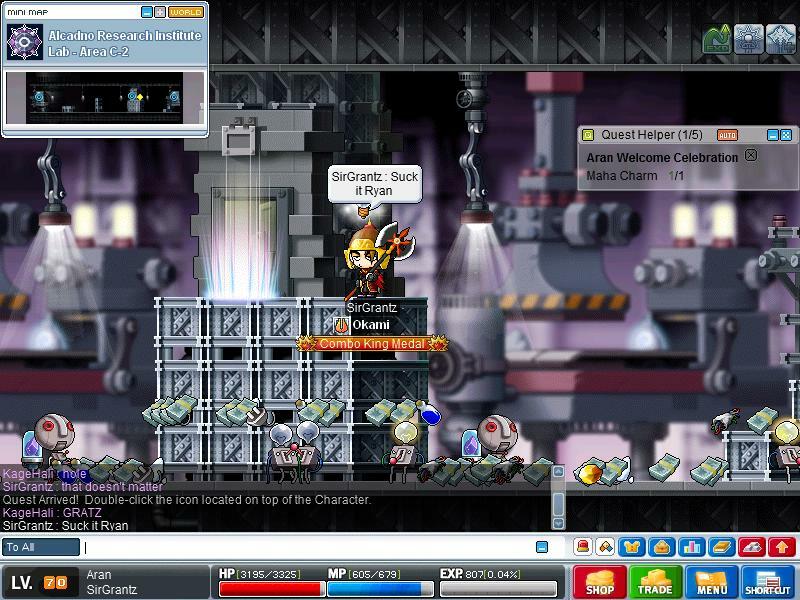 Do remember that I haven't played Maplestory since when I was punished. We were under the impression you quit of your own accord. You weren't pulling our legs were you? WHY WOULD YOU LIE TO US?!?!?! It was a somewhat cause of me quitting. But waiting for my new computer was more of a cause. So I just decided myself to quit for a bit. Sure I'll catch you online soon though! YEAH!!! We gpqed like 4 times together!!! And we even won a couple! Wish I didn't un install it too. Well you could still be in Decible or whatever, but we're allianced with a new guild now! Are they more active than us in Decible? Seeing as how Decible was pretty much dead. When I was on it was. Maybe only one person went on it when I was there.